The temperature here is -9°F and still dropping, so I thought it might be an appropriate time to post a picture of this odd little circular slide rule. This slide rule belonged to my grandfather, who was a meat inspector for the US Department of Agriculture. 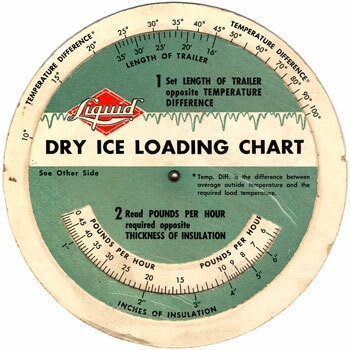 The slide rule was used to calculate how much dry ice was needed to fill a railroad car to keep a load of beef frozen until it reached its destination. The back side bears the date 1954.